Guilford Art Center announces it will host a trunk show for jewelry by Michael Alexander Jeweler on Saturday, April 14 from 10am-4pm. Artisan jewelry and Guilford Art Center Craft Expo exhibitor Michael Alexander will make a trip to Guilford for this special, one-day pop-up event. 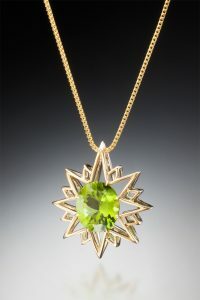 Michael’s work is known for its strong minimalist lines, iconic structural profiles, and beautiful and unusual gemstones. Come meet Michael and his wife, Andrea, and view their latest designs, place an order, or discuss customization.